A friend of mine who is a cancer survivor runs online auctions of items donated to her. Last year a print of mine raised over $1,000 for her charity. While I do not expect the same results here, I thought I would offer a special print of mine for people to bid on to raise funds for my Relay for Life team in support of cancer research by the American Cancer Society. "Bridge of Hope" - Spring comes to the gorge in Taughannock Falls State Park near Ithaca, New Yorik. Bridges to me symbolize a journey one takes to get from one place to another. In the case of someone fighting cancer, the journey is long and full of obstacles. Bridges are held up by pillars. For a cancer survivor those pillars are the people who love and support them and the doctors, nurses and other healthcare professionals who do what they can to cure them. The goal is to complete the journey to the other side of the bridge. The journey often does not end as we’d like but some do bringing hope to all. The waterfall is another symbol…for me it is the enduring human spirit. In whatever you see of the print offered above, please, consider placing a bid. ITEM DESCRIPTION: 20″ x 30″ Bridge of Hope Giclée Canvas Stretched Print – Canvas Stretch/Staple mounting is a unique way to display your images like a fine art canvas. The print is stretched to the edge of a 3/4 inch thick wooden frame, and stapled around the edges, leaving the full image on the front. Suitable for framing or hanging as is. STARTING BID: $50.00 Bid increments must be $5.00 or more. Bid high and bid often! TO BID: You must leave a comment with your bid amount in US dollars. Once a few bids have been made, only the current high bid will be visible. The winning bidder will be notified via email with details on how to make the donation to my online Relay for Life Team account which accepts all major credit cards. The winning bidder will have 36 hours to respond to the winner email confirmation and make the online donation. Should the online donation not be made within 36 hours of the auction close, the bid will be considered abandoned and the 2nd highest bidder will be offered the item at the highest bid price. If the 2nd highest bidder fails to make a donation, I will put the print back up for auction one more time. Shipping is included. If you have any questions, leave a comment or use my Contact form. VERY IMPORTANT: All bids/sales are final. There are NO RETURNS and NO REFUNDS. In case of duplicate high bids, the earliest time-stamped bid will prevail. 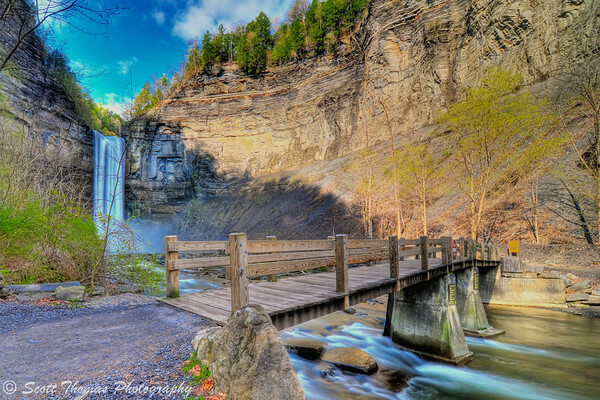 This entry was posted in Nature and tagged american cancer society, auction, bridge, canvas print, creek, fundraiser, gorge, ithaca, new york, relay for life, stream, taughannock falls, trail, waterfall, wooden. Bookmark the permalink. A great picture of a beautiful spot we’ve been to often. I’ll start the bidding at $50.00. I love your work, Scott. Bidding is now officially closed…thank you all for your participation!